Wire data analytics platform helps research hospital's IT, clinical, and business operations run smoothly by providing complete visibility into its Citrix environment and supporting infrastructure. DENVER, CO – BriForum – July 20, 2015 – ExtraHop, the global leader in real-time wire data analytics for IT intelligence and business operations, today announced a specialized offering that helps customers maximize the efficiency and value of large-scale Citrix VDI initiatives. 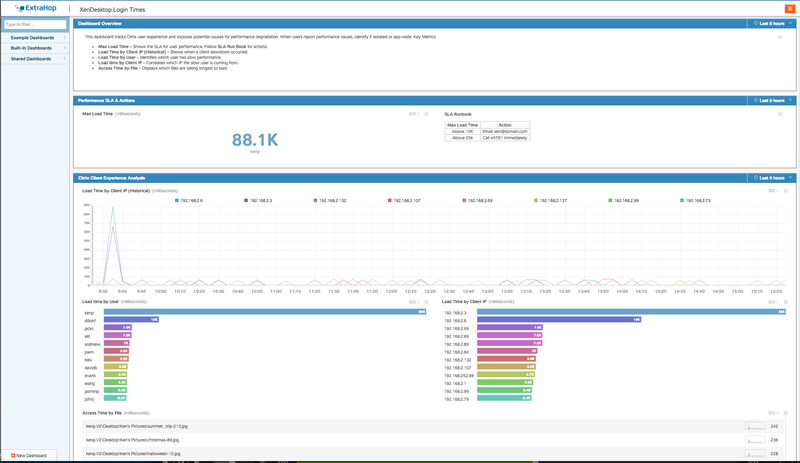 The ExtraHop Citrix Module delivers end-to-end, real-time visibility, giving customers a clear view across both their Citrix environment and the supporting infrastructure. For one healthcare delivery organization, this insight helped them save hundreds of thousands of dollars in specialist consulting fees and reduced Citrix VDI login and load times from 45 seconds to 10. Complete visibility into the Citrix delivery chain from remote access to XenDesktop servers to authentication and storage. Ability to troubleshoot and reduce Citrix login and load times to increase business productivity. Clear visualization and guidance around interactions and dependencies between the VDI deployment and the rest of the IT infrastructure. For one large research hospital, the visibility and prescriptive guidance delivered by the ExtraHop platform not only saved them an estimated $400,000 in consulting fees but salvaged their entire Citrix VDI deployment. Prior to deploying the ExtraHop platform, the hospital had undergone a large-scale Citrix VDI expansion to support over 4,000 clinical and business users and more than 100 applications. While the initial Citrix rollout was successful, within a few weeks login times had slowed to 45 seconds or more—an eternity for clinicians trying to access critical patient information. "The hospital even brought in Citrix specialists to diagnose the problem, but with the tools they were using they could only confirm a slow-down, not where it was coming from," said John Smith, Citrix Technology Professional and Solutions Architect at ExtraHop. "Without the ability to see across the entire application delivery chain, the complex and interdependent Citrix environment remained a black box." With ExtraHop, the IT team at the research hospital was able to pinpoint the specific server associated with the slow login times, and then drilled down to see login times on a user-by-user basis, as well as the specific L7 protocols being used by the specific server. "As it turned out, the 'ghost' in the hospital's VDI infrastructure was a large number of hi-resolution .jpeg files being downloaded to a particular user's profile each morning," said Raja Mukerji, Co-Founder and President, ExtraHop. "This was causing storage I/O contention, slowing Citrix login times for all users. The fix was as simple as removing the My Pictures folder from the user's profile, but the problem had almost derailed the entire Citrix VDI deployment. With ExtraHop, the hospital not only saved thousands on consulting fees, they saved their entire VDI investment." Learn more about how customers are using ExtraHop to gain visibility and proactive guidance to dramatically improve Citrix performance. For more use cases and customer stories, visit ExtraHop in Action.